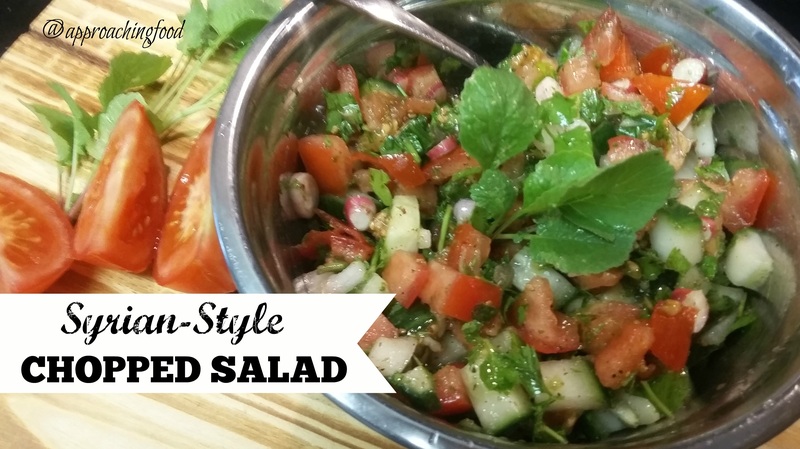 Syrian-Style Chopped Salad: An Easy Beat-the-Heat Dish! Deliciously fresh and cool and perfect for a summer lunch or dinner! Inspired by some Syrian-Canadian friends, I made a Syrian-Style Chopped Salad this weekend! This is the perfect dish to make with all the fresh produce available in summer. The primary ingredients are cucumbers, tomatoes, and fresh herbs, and it’s so refreshing to eat chilled for dinner on a hot summer’s day! There is one less common ingredient: zaatar. Zaatar is an Arabic spice, and used in Middle Eastern cooking. I’ve used it before, as I grew up with it, and while I didn’t have it in my pantry, I asked my dad to borrow (er, have) a few tablespoons worth. You can probably find it at a local bulk store in a large city, or at a speciality food store. I believe my father buys it from a Middle Eastern grocery store, but even the local discount grocery stores have ‘exotic’ spices in their aisles these days, so I’d suggest looking there first. Have I made it sound appetizing enough yet? Then let’s get cooking! This is an easy, beat-the-heat dish to make from fresh garden produce! Can be adapted to add grains or protein. Combine all ingredients in a bowl, and stir. Chill for half an hour or until serving. Enjoy! 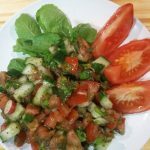 You can add in couscous or bulgar to make this a heftier salad; just add in a bit more lemon juice and oil. Alternatively, you can add in feta cheese, cubed & fried tofu, or even cooked chicken for some protein. Make it your own! By the way, this salad is so delicious that even my meat-a-tarian DH, who usually gamely eats whatever vegetarian dish I gave him but doesn’t choose vegetarian food if he has a choice, ACTUALLY ATE SECONDS OF THIS SALAD! Of his own volition! So yes, I will be making this a lot! Although I’ve classified this salad as a vegetarian side dish, you could easily make it a main dish by adding in couscous or bulgar (cracked wheat), and adding in some crumbled or cubed feta cheese. And as I (the Queen of Substitutions) always encourage, make it your own by using whatever fresh produce you have in your garden or available at the local stores! Next Post: I’m thinking the Shake n’ Bake tofu that I mentioned in a previous post. So many ways to use this versatile (and UBER-delicious protein)! And I’m not generally a tofu fan, so you KNOW it must be good! Linking Up at Meal Plan Monday! And at Happiness is Homemade! This entry was posted in Salads I Have Known and Loved, Vegan, Vegetarian Side Dishes on July 22, 2018 by Margaret. Sounds delicious and very easy to make a this time of year. I have had zatar as a “dip” – mixed with olive oil to have with bread and I’ve seen i in my Bulk Barn so not difficult to find. I thought it would be a “hot” spicy taste but I found it to be different from what I was expecting – but I liked it. I love zaatar as a dip! A swirl of olive oil, some zaatar, and some fresh bread = perfect snack! I have never used zaatar nor seen it in our tiny little country grocery store. What does it taste like? Zaatar is a savoury seasoning. There’s dried sumac and thyme and sesame seeds, so to me it tastes vaguely salty, even though there is no salt. If you’ve ever eaten at a Middle Eastern restaurant, they may have used it as seasoning on the bread, or sprinkled on top of hummus or served with oil and bread as an appetizer. It’s really yummy! I have eaten at Middle Eastern restaurants but had no idea what I was putting in my mouth -sometimes ignorance is bliss. The food was delicious. When I go to the local grocery store I will check in the spice section and see what I can find. I’m totally curious to see if you can find it in your local grocery store! I’m guessing not, but with the world so global these days, who knows!